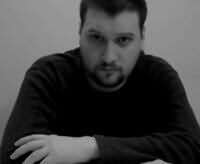 Born in Texas and currently living in Utah, David Dunwoody writes subversive horror fiction, including the EMPIRE series and the collections DARK ENTITIES and UNBOUND & OTHER TALES. His short stories have been or will be published by outfits such as Permuted, Chaosium, Shroud, Twisted Library, Belfire and Dark Regions. "A harrowing new perspective on the apocolypse. Giglio goes for the heart as well as the juguler."